Verbal abuse and intimidation by children and teens isn’t just a phase that goes away—it doesn’t just happen. It often has deep roots that begin very early in a child’s development. And it often begins as a way for kids to try to get power through controlling their parents. In this article, I’m going to show you how your child’s abusive behavior may have evolved. In a companion article, I’ll show you what you can do to stop it. It should be noted that this article is about abusive children who cross a line when they start attacking people verbally, demeaning others, or threatening to harm themselves or someone else. The verbalization of threats, name-calling, and intimidation is common and the aggressive behavior usually begins at a very early age. When parents change their rules because a child throws a tantrum or verbally abuses them, they’re teaching that child that he can have power over them through inappropriate behavior. This article is not about typical kids who, as a normal part of development, get mouthy at times as a reaction to stress, chaos, or adolescent changes. They can become testy in their answers to you, and their tone may become defiant or condescending, but the behavior does not cross the line into verbal abuse. For these types of behaviors, I recommend my article Sassy Kids: How to Deal with a Mouthy Child. Why Does My Child Swear at Me? Why do kids threaten and verbally abuse their parents? One reason is that these children feel powerless. In other words, they lash out in an attempt to gain more control. Another reason is that they don’t have the problem-solving skills necessary to deal with frustration, to deal with disappointment, or to resolve conflicts in a more appropriate manner. Children may fail to develop social problem-solving skills for a variety of reasons, which include diagnosed and undiagnosed learning disabilities, family chaos, or individual temperament. Consequently, these kids often become overwhelmed, and they get frustrated that they don’t know how to solve social problems appropriately. In order to compensate for their lack of tools to deal with these uncomfortable feelings, they resort to name-calling, threats, and verbal abuse of those around them. Let’s say you have a child who, for whatever reason, has poor problem-solving skills. He sees the message of power in the media, in his community, and in his culture. 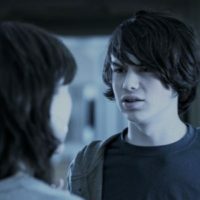 He then learns how to use power in the form of threats and verbal abuse to replace his lack of problem-solving abilities. Instead of having to deal with his emotions and overcome whatever given obstacle is in his path, that child uses acting-out behavior, aggressive behavior, and abusive behavior so that somebody else has to solve his problems for him. In effect, his bad behavior becomes a way to solve problems. This is a very dangerous pattern for a child to develop. 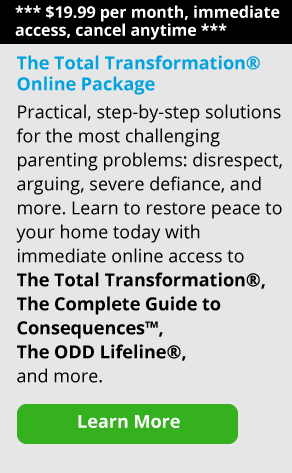 What parents don’t always understand is that chronic defiance in children develops over time. And it can start very early on. It develops as lessons are learned by the child from interactions with his parents. Yes, our kids are learning from us, 24 hours a day and 7 days a week, whether we realize it or not. Let’s take the case of a child who was a fairly normal baby. He’s achieved all the developmental milestones, was perhaps a little cranky at times, but generally, behaved age-appropriately. As he gets a little older, he starts having more problems. At about the age of five, he begins to balk at the idea of picking up after himself, whether it’s his dirty clothes going into the hamper or toys with which he’s been playing. If he’s told to clean things in his room, he goes to the living room instead of complying. When asked to finish the task at hand, he says, “I don’t want to,” and that becomes his first battle cry. When pushed, he will do things grudgingly, but only when adults are watching him. And as soon as they leave the room, his compliance stops. Very early in life, children have to learn to deal with the word “no.” They have to learn to deal with the feelings of frustration or anger that are triggered when they hear “no.” In a way, being told “no” is a social problem that they have to solve. Most children learn how to deal with “no” reasonably well. They learn to manage the feelings of anger and frustration of being told “no.” But when the children I’m talking about are told “no,” their behavior escalates until they have a tantrum. Some parents will respond to this behavior by lowering their expectations. They don’t make their child pick up after himself. Or they pick up his dirty clothes and toys themselves rather than dealing with his resistance and excuses. In fact, it is easier to do it themselves. For the parents, this can seem like a really good way to cut down on the fighting. After all, it only takes them 30 seconds to put the books away and pick up their child’s laundry. In contrast, a fight can ruin the evening. By the way, it is very common for parents to do this and, in many cases, the kids don’t end up defiant. Abusive kids are different, though. There are certain children who figure out that their parents changed the rules and expectations out of fear of resistance and acting out. And these kids learn to take advantage of that fear. For these children, what tends to happen is that they start throwing more tantrums, yelling more frequently, and using these inappropriate behaviors to solve their social problems. Their tantrums are a means to get their way. What tends to happen over time is that parents learn to read their child’s signals. They see that the behavior is escalating, and they try to do something about it before the tantrum begins. In other words, the parents begin to lessen their demands as the child gives them cues that he’s going to soon lose control. That lowering of expectations usually occurs by over-negotiating, compromising, or giving in to their child’s demands. In this way, these kids learn to shape the behavior of the adults around them. Let me be clear: when parents change their routine because a child throws a tantrum, or verbally abuses them, they’re teaching that child that he can have power over them through inappropriate behavior. It’s a lesson the child learns quickly. During this back-and-forth process, parent and child are both learning to deal with one another. The parent in these situations learns that if the child is indulged, he stops acting out. This is important for most parents because tantrums are stressful, frustrating, and even embarrassing. Getting the current tantrum to end becomes their first priority. And so the parents learn that if they do what their child wants, things will get easier, at least for the moment. Likewise, the child in these situations learns that if he acts out or threatens to act out, his parents won’t hold him accountable and he will get what he wants. This can happen even at 24 months old. Over time, this back-and-forth trains parents to be more and more tolerant of inappropriate behavior and trains kids to use acting-out to get whatever they want. Ultimately, the child ends up in charge. Of course, as the child gets older, tantrums take on a very different look. Older kids know that lying on the floor and screaming and kicking their feet makes them look ridiculous. So, the behavior evolves. At a certain age, they learn various forms of verbal abuse, including name-calling, putting others down, and threatening. But this behavior, learned by interacting with mom and dad, begins to cause problems outside the home. In particular, when these kids enter school, they often get in trouble with their teachers because the schools usually don’t tolerate the behavior. And they have trouble getting along with other kids. This makes sense when you think about it. Take the sandbox, for example. The sandbox is a very common-sense place. If your child is in the sandbox with other kids and he’s yelling at them and calling them names or threatening to hurt them, they won’t play with him anymore. That’s all there is to it. Inappropriate behavior that works at home typically doesn’t work in social situations. And if the other kids are forced to accommodate him, once again he will fail to develop appropriate social skills. The lesson that he can get his way by verbally abusing others is thus reinforced. So the intimidation between that child and his parents, and between that child and his peers, can start pretty early. And when the intimidation is tolerated, the behavior is reinforced and it gets worse over time. It is important to remember that there might be any number of reasons why a child is susceptible to being unable to handle the difficulties life presents. He may have ADHD, an undiagnosed learning disability, a chaotic family life, or just a personal tendency to be oppositional. In the end, though, I don’t think that it matters what started the issue. What matters is that the child begins to learn how to solve his problems appropriately. The truth is, teaching our children problem-solving skills is a core part of our job as parents. To that end, we should teach them the lesson that tantrums, screaming, yelling, name-calling, verbal abuse, and intimidation will not solve their problems in the real world. And the best way to teach kids this lesson is to ensure that these behaviors do not work in the home. And to ensure that verbal abuse is never rewarded or indulged. Remember, verbally abusive adults usually started out as verbally abusive children.